Need help applying your new decal or sticker? 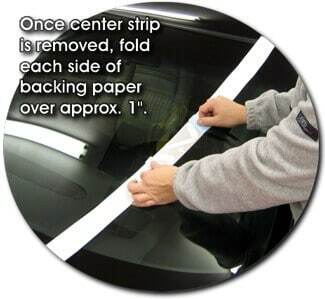 Don’t worry we have step by step instructions on how to apply your new Decal! 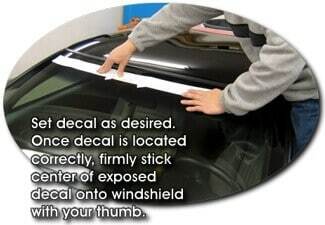 Weather it is a small sticker for your car, a jeep hood decal or a large windshield Banner Decal, we have you covered. 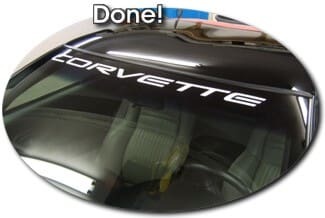 This can be done by removing the backing layer, then, holding the transfer and vinyl layers with both hands stick your decal to your desired spot, then after rubbing over it with a card or squeegee, remove the transfer layer. All that should remain on your surface is the die-cut car decal. become familiar with desired placement. paper from the center as shown. side of the backing paper approximately 1″ (25.4mm) onto itself. the center exposed area down with your thumb. an application squeegee or soft non-marring tool. squeegee out the air towards the puncture. maintenance and should be treated similarly to a painted surface. Wash your graphics with plain soap and water or any commercially made car wash soap. Rinse thoroughly. Please wait a few days after installtion to wash to insure a good bond. 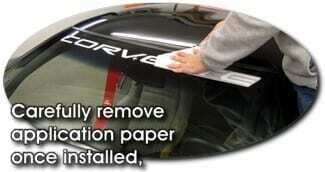 Test any cleaning solution on a small section of the decal before using. 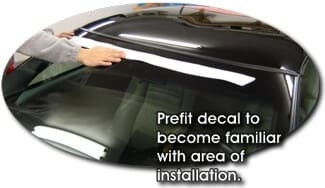 Be sure to read the solution’s directions and warning notices that may apply to Vinyl Graphics. Don’t use any aromatic solvents such as acetone, M.E.K., toluene, paint thinner, or lacquer thinner on your graphics. 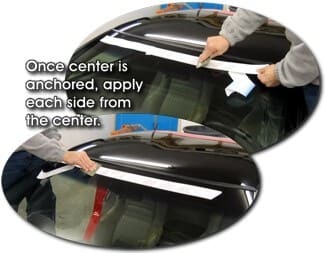 Any solvent may soften the vinyl material or smear colors. Don’t apply wax over graphics. Wax products generally contain petroleum distillates, which can damage vinyl graphics. 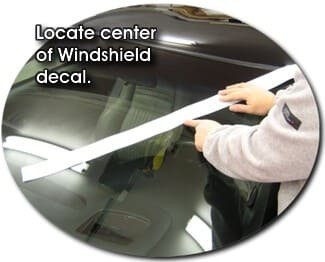 wiper blade damage, ice scraper damage, or any other type of damage that may occur. While these occurrences all prove to be out of our control, rest assured that the vinyl materials used are Premium grade with a life expectancy in regard to colorfastness of 5-7 years. From Glass: Use a razorblade or scraper (metal or plastic) to lift an edge of the vinyl until you can grab it with your fingers and peel off. 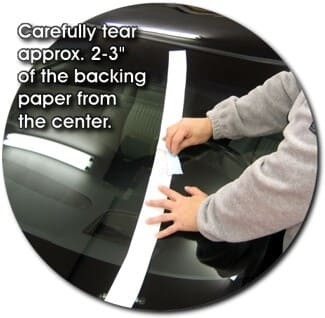 From Vehicle Body: Use a plastic razorblade or scraper so you don’t scratch your clear coat. Tips: For stubbornly stuck vinyl, heat mildly with a heat gun or hair dryer, then use above methods.